The chickpea is a legume of the family Fabaceae. A high protein seed, it is among the earliest cultivated legumes with 7,500-year-old crop remains found in the Middle East. Bumping along the dirt roads of rural southeastern Turkey in a battered Jeep, Sergey Nuzhdin and his team of collaborators got an occasional glimpse of the plumes of smoke rising across the border in war-torn Syria. 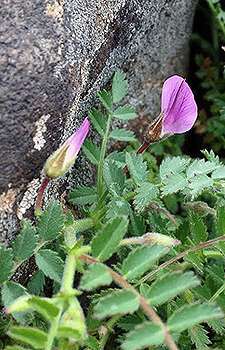 Their focus however, was not on the political crisis engulfing Turkey's embattled southern neighbor, but on scanning the landscape for the tiny purple flowers associated with wild chickpeas—a protein-rich legume that could help avert the world's looming food crisis. Nuzhdin, professor of biological sciences at USC Dornsife, is a key member of the new Chickpea Innovation Lab, the latest of 23 "innovation labs" awarded under "Feed the Future," the United States Agency for International Development's (USAID) global hunger and food security initiative. The Feed the Future Innovation Lab for Climate Resilient Chickpea is led by professor Doug Cook of the University of California, Davis, with key collaborators at USC, Florida International University, Turkey's Harran University and the Ethiopian Institute of Agricultural Research. "Experts are predicting that global food production must double between now and 2050 to feed the world's rapidly growing population," Nuzhdin said. Current crop yields, however, are at risk from variable climate, including high temperatures and drought. Nowhere is the problem more severe than in regions of sub-Saharan Africa, including in Ethiopia where the Chickpea Innovation Lab aims to have its greatest impact. "It's not just that we need more food, we need food that's nutritious and resilient to climatic extremes," said Cook, professor of plant pathology at UC Davis and director of the Chickpea Innovation Lab. Chickpeas—or garbanzo beans—the world's third most widely grown legume crop, might well be part of the solution. 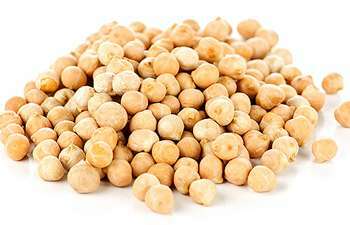 Not only are chickpeas extremely high in protein, their natural ability to "fix" atmospheric nitrogen also contributes to soil fertility. In developing countries, the crop provides a crucial source of income, food security and nutrition to poor farmers. The project is unusual in its breadth, Cook said, combining basic research in genomics, genetics and quantitative biology with applied efforts for trait selection and breeding in the agricultural context, with connections that span the globe. USAID's five-year, $4 million genetic research program—of which $1 million is slated for USC Dornsife—aims to improve climate resilience in chickpeas. This would expand the climatic range in which they can be cultivated. By creating more and higher yielding varieties of chickpea, the productivity of small-scale farmers would also increase. The research team traveled to Turkey because this is one of the regions where agriculture first began some 10,000 years ago, when our ancestors started domesticating wild plants into crops. Among the so-called "founder crops" were chickpeas, which were brought into cultivation alongside barley, lentil, pea and flax. Domestication was at first a casual process, one in which humans selected rare species with traits that made them good crops, but poor competitors in the wild. As the sophistication of farming increased so did the intensity of breeding efforts, which selected fewer and more superior individuals. The downside was that these efforts extracted and then increasingly narrowed the genetic potential from the wild species to create the domesticated crop, with most of the genetic potential left behind. One consequence is that chickpea cultivation cannot easily be expanded into more extreme environments. "In modern breeding we have become much more intensive in our selection of crop varieties and reduced the amount of diversity in our crops even further," said Eric von Wettberg, assistant professor in ecology and evolutionary biology at Florida International University. Although that makes for more productive crops under intensively managed agricultural conditions, reduced diversity also means reduced breadth of traits, such as the ability to deal with drought or flooding, or to tolerate diseases. Nuzhdin and his fellow researchers now aim to tap the additional genetic potential of wild chickpeas to create better, more resilient varieties of cultivated chickpeas by concentrating on traits that mitigate against heat, drought and frost and those that encourage increased nutrition and disease resistance. Ethiopia, the largest chickpea producer in Africa, was chosen as the thematic focus of the project because of its long history of chickpea cultivation stretching back more than 2,500 years. As a result of their religious practice of fasting, which involves reduced intake of animal protein for months at a time, many Ethiopians have a high dependency on chickpeas as a source of protein nutrition, which they otherwise lack. The Ethiopian Agricultural Transformation Agency (ATA) aims to double the country's 2010 yield of chickpea with the help of Ethiopian scientists and farmers, and in partnership with global researchers. The Chickpea Innovation Lab will be an important component in this effort. This new research will benefit millions of developing country farmers who grow chickpeas as a source of much needed income, as well as for its ability to add nitrogen to the soil. So far, the team has completed five trips to Turkey and gathered 1,300 samples, often asking local shepherds where to find plants. They will continue to gather more samples from a 37,282 square-mile area during an additional 15 trips over the next two years. Once gathered, the samples arrive at Nuzhdin's lab for genetic testing. "We analyze the wild material by sequencing to understand its natural diversity," Nuzhdin said. "Then, working in conjunction with our domestic and international colleagues we will determine which natural variants in the genome of the wild chickpea have the potential to enhance the performance of cultivated varieties." Ultimately the plants will be tested for tolerance to heat, frost and disease resistance at five locations around the world: Canada, Australia, the U.S., Turkey and Ethiopia. Each country already has cultivated varieties adapted to its agro-climatic zone, so researchers will cross the wild varieties with the cultivated plants preferred in each region to make them more successful in specific environments. This ensures that the first steps toward breeding and trait analysis are undertaken in the appropriate genetic background. Once analysis is complete, breeders will use the results to develop improved genotypes and varieties. "USAID's focus is on deliverables," Cook said. "They measure things not by the number of sequences we generate, or the number of new varieties we are going to produce, but by the impact we have on the livelihoods of resource-poor people." The genomic research at USC Dornsife is the bridge that will allow the research team to achieve that real-world goal. Advancements in the past few years have made it possible to conduct this research in a more precise way, Nuzhdin said. "I think the issue of how you can enhance the performance of cultivated varieties by utilizing naturally occurring variation and the principles of evolution, ecology and population biology will become a central focus in agricultural research," he said. "The combination of genomics and computation is already used by cattle breeders to improve their stock four times faster. Here in California, the same paradigms will be used to improve shellfish, which need to be domesticated from local populations in order to start offshore farms. "This project is particularly interesting because it establishes a paradigm that has the potential to be used in multiple ways in the future." As for chickpeas, Nuzhdin, Cook and von Wettberg believe the resources generated by wild varieties have the potential to change chickpea breeding for the next century, creating a vital solution to help feed the world. This sounds much better than being subjected to the unknowns of genetic modification that is prevalent at this time.